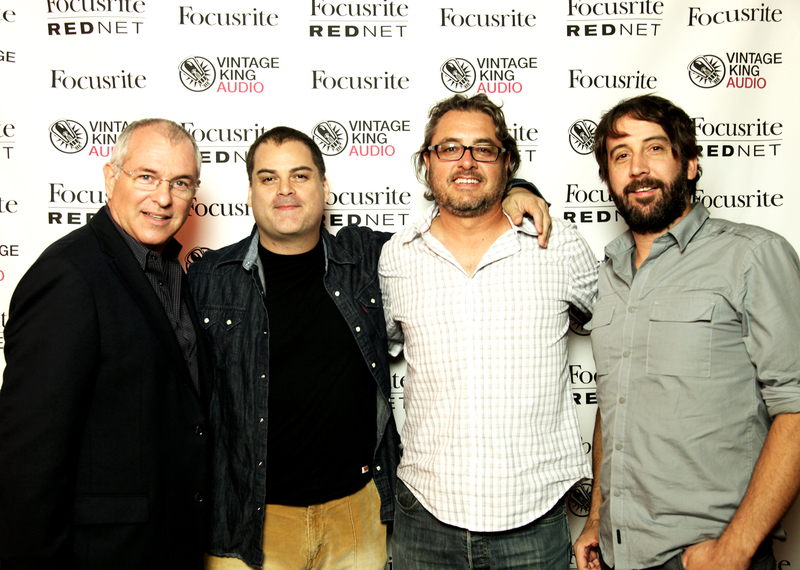 Shown L-R: Phil Wagner, President of Focusrite Novation Inc.; Dean Martin Hovey, Founder/Creative Director, Soundwell.tv; Ted White, RedNet Product Specialist; and Shevy Shovlin, Vintage King Audio Director of Partner Marketing Photo by Brian Ulrich. © 2013. 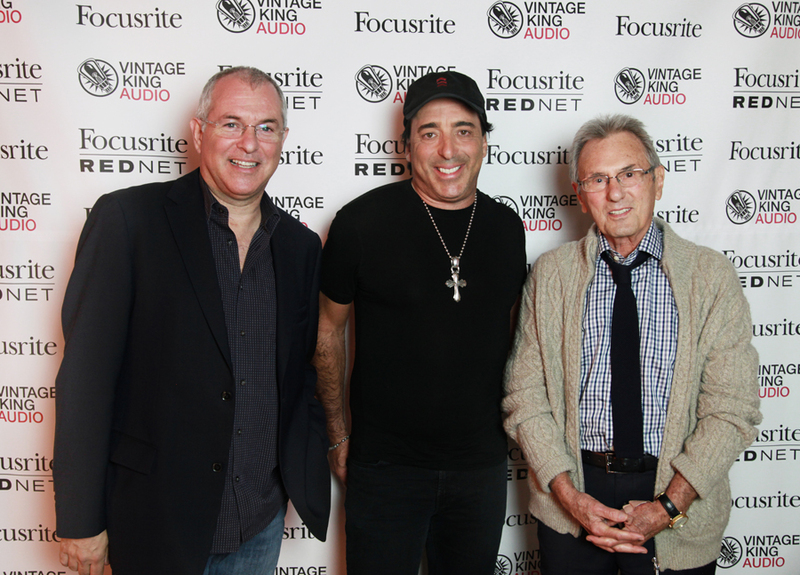 Shown L-R: Phil Wagner, President of Focusrite Novation Inc.; and legendary producer/engineers Chris Lord-Alge and Al Schmitt. Photo by Brian Ulrich. © 2013. Los Angeles, CA, October 2, 2013 – On Thursday, September 26, 2013, Vintage King Los Angeles (VKLA), located at 1176 W. Sunset Blvd., was the place to be as Focusrite presented a showcase of its acclaimed RedNet Ethernet-networked interfaces, which are based around the industry-standard low-latency Audinate Dante® audio networking system. The event’s attendance read like a who’s-who of the pro audio community, with such leading industry figures present as Chris Lord-Alge, CJ Vanston, Michael Bradford, Dave Reitzas, Herb Tarwick, Al Schmitt, Steve Genewick and Dean Martin Hovey. The daylong event began with individual one-on-one sessions at 10:00 a.m., 1:00 p.m., and 3:00 p.m., followed by a 7:00 p.m. evening mixer. Also in attendance were members of Vintage King’s Los Angeles sales and support staff, as well as personnel from Focusrite. “This great event has left us with the multi-DAW composer system running and ready for demonstration at Vintage King Los Angeles" stated Shevy Shovlin, Vintage King's Director of Partner Marketing. "You can see a live system in use, and hear audio being transported in real-time around our showroom and demo studio." Photo Caption 1: Shown L-R: Phil Wagner, President of Focusrite Novation Inc.; Dean Martin Hovey, Founder/Creative Director, Soundwell.tv; Ted White, RedNet Product Specialist; and Shevy Shovlin, Vintage King Audio Director of Partner Marketing Photo by Brian Ulrich. © 2013. Photo Caption 2: Shown L-R: Phil Wagner, President of Focusrite Novation Inc.; and legendary producer/engineers Chris Lord-Alge and Al Schmitt. Photo by Brian Ulrich. © 2013.